In the larger scope of Northern European countries, Iceland can often be somewhat overlooked. Tucked away ‘in the corner’ and lacking the glamorous profile of neighbours such as Sweden and Finland, the island with the deceptive name – it is mostly green – therefore attracts a smaller amount of tourists than the rest of Northern Europe and Scandinavia. That is not to say, however, that the country lacks charm, or is devoid of attractions in its own right. Much to the contrary! As anyone who has travelled across the further regions of Northern Europe will attest to, one of the world’s most impressive natural phenomenon can be witnessed in this country: the world-renowned Northern Lights. Iceland is one of the few countries far enough north to allow tourists the privilege of experiencing this dazzling natural light show, and it is definitely one of the strongest arguments in favour of visiting this spectacular location – although, in fact, there are plenty more. 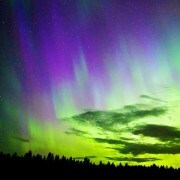 Speak to any keen traveller and chances are they will have heard of, but never actually seen, the Northern Lights. Iceland is, as mentioned above, one of the few countries from which this phenomenon can be experienced – alongside Canada, Finland, and certain other parts of Scandinavia – so unless a traveller has forayed into these specific locations, the Lights often remain a dream rather than a reality. Taking place primarily in autumn/winter, this is a phenomenon not to be missed by tourists planning to visit the Arctic regions at that time of year. Those that are lucky enough to witness nature’s light show first hand are unlikely to ever forget it – seeing the lights is one of those once-in-a-lifetime experiences that strongly affects the viewer. Many people may not actually be aware of what exactly causes this fascinating phenomenon, and while it seems otherworldly, there is actually an easy to understand explanation. Also called the Aurora Borealis, the Arctic Circle’s main attraction is caused by a meeting of electrically charged particles emanating from the sun. The Earth’s poles, with their magnetic pull, attract these particles towards the ground, and as they come into contact with the different types of gases in the Earth’s atmosphere, they gradually change colour to create the Northern Lights. Iceland is one of the best places to view the lights and tourists and science aficionados visit each year to witness it in person. Nor is undertaking this endeavour as hard or costly as it once was. While not so long ago it would take considerable expenses and careful planning to be able to see the Northern Lights, Iceland and the rest of Scandinavia are now closer than ever, thanks to excellent specialised tours companies, which are dedicated to ensuring the best possible experience. There’s now no excuse for anyone to miss out on seeing this unforgettable phenomenon first hand. United States is the most watched and most desirable country in the world. Everyone dreams of an excellent holiday time in the United States. To mark the best holiday spots in the United States, you will find many articles on the internet, but none of them will lead to your most desired destination. So, to give you a solution to this problem, I have prepared an article that will not only provide you with the best holiday spots, but also will give you a clear insight of those places as well. Here is the must go list of the best holiday spots. Though New York City is the costliest city of all, but it also represents the most iconic status among many other states of U.S. The reason behind this recognition is that New York City is full of energy and vibe with culture, restaurants, shopping, sports, history are to be found in abundance. This can be the sole reason for you to go for a holiday there. 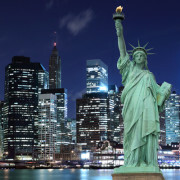 In addition, it boasts some of the most well-known establishment in the form of Metropolitan Museum of Art, the Statue of Liberty, and Empire State Building. So, you will not be short of options for sightseeing of the city. For food and history lovers there is no other best place than Chicago, Illinois because this city has many historical monuments and boasts some of the best restaurants as well. So, you can definitely plan your Holiday here and when you will come to this city you must take an architectural-history tour. Besides, you can dine at the Alinea (the most famous molecular-gastronomy restaurant in the U.S.). Additionally, don’t forget to visit the biggest science museum in the Western Hemisphere and the museum of Science and Industry. Although San Francisco, California has many fogs in its weather, it is still among the best holiday spots in the United States. In the daytime, you can enjoy while discovering the Fisherman’s Wharf and the Aquarium of the Bay. This is not the end as you will be able to ride a cable car along with the opportunity of strolling around the Presidio. In the night, you shall be intrigued if you have a smack at the Michelin-starred restaurant or a small place in Chinatown. You can hover around the best clubs on the west coast region as well. So this city is certain for a memorable holiday. Las Vegas, Nevada Yes! We are talking about the most glamorous states of U.S. where millions of tourists come and have a crack at what’s on offer. There are so many exciting hotels with world-class amenities. Furthermore, this city has many casinos and restaurants that will pop up in the mind of Holiday seekers. In addition, the nightlife in this great city is always jaw dropping with many lights and buzz of the casinos. So it is very normal that this city will be top choice for many travelers and tourists for a holiday. 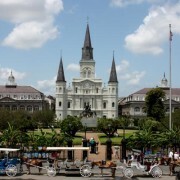 The unofficial mottos of New Orleans, Louisiana are ‘laisser les bon temps rouler’, or ‘let the good times roll’ and they represent the Southern hospitality of this city. If I talk about it more, I would suggest you to take a tour to the graceful Garden district or you can roam in a jazz club as well. What’s more, the dining option at the Commanders Palace will be a pleasant choice and the crowds of the Bourbon Street will count as bonus to provide you a best holiday experience. After reading out the article, I can say that you know where to go for a holiday in the United States. Therefore, don’t waste any time, just pack your belongings and travel to the favorite spots in the U.S. for a memorable and value added holiday. It’s the capital city of China; therefore, it’s the political, cultural, economic, communication, international, and educational center. Due to this you will find any amenity in this city. If you are looking for a good place to eat, there is the roast duck, imperial court food and other great eating joints. There are many places that you can visit while in the city. For example, you can visit the great wall, Forbidden City, summer palace, Ming Tombs, Hutongs, Temple of heaven and Beijing zoon. If interested in a hotel to live in, the city has some of the best hotels in the country. For example, there is Hulu hotel, New World Beijing hotel, Red wall Garden hotel, Kerry hotel Beijing, the opposite house, and many others. It’s located in the southern side of Guadgdong province and it neighbors Hong Kong and Pearl River Delta. Due to its location, Shenzhen is one of the fastest growing cities in China and when you visit it you will be impressed by its fast-paced urban life. There are many places that you can visit when you are in the city. For example, you can visit Dameisha seaside resort and Thailand Royal Palace also known as the window of the world. If you want to live for a few days, the city has many great hotels such as Hui, Ritx-Carlton, Futian Shangri, Grand Hyatt, and Intercontinental Shenzhen. It’s the capital city of Hubei province in central China and it’s situated on jianghan plain. One of the most attractive features of the city is the low cost of living; therefore, if you are visiting China and you are on a low budget this is city that you should consider staying in. Some of the best hotels in Wuhan are: Wanda Reign, the PuYu hotel, Marco Polo, Howard Johnson pearl plaza, Shangri-La hotel, Wanda Realm and Ramada plaza. There are many places that you can visit when you are visiting Wuhan. Some of the best places to visit are: Jin Zhu Temple, sculpture, yellow crane tower, and Bronze vessel. These are some of the best places to stay while in China. If you are planning of staying in a hotel, you should book early in order to not only be assured of a room to stay in, but to also attract great discounts. It’s easy to be seduced by the promise of Caribbean luxury hotels. 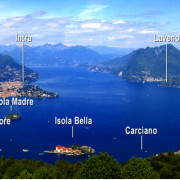 Many are based in stunning locations and offer the ultimate luxury holiday experience. But even if the origin of the idea is clear, choosing a specific location might end up being rather more of a challenge. For a start, different people have rather varying ideas as to where the Caribbean actually is. If that sounds ludicrous in the days of global SATNAV, it’s attributable to the fact that the area can be defined in different ways including: geographic areas; geo-political associations; economic areas; advertising and marketing domains. Strictly speaking, it’s a sea that sits to the south of Cuba, Haiti and Puerto Rico and includes islands such as Jamaica, St Lucia and Grenada. However, in terms of holidays, it’s sometimes ‘stretched’ as a term to include the Bahamas and on some maps even the Florida Keys. Some people have even shown Bermuda as being a Caribbean holiday destination when it is, in fact, way out into the Atlantic. Purists might debate these boundaries furiously but for many holiday companies a vast area of ocean is often referred to, albeit incorrectly, and you’ll see Caribbean luxury hotels advertised almost everywhere within it. So, how to go about choosing where you will go? One start point might be on the background culture of the island. Some have a huge legacy of Spanish culture, such as Cuba. 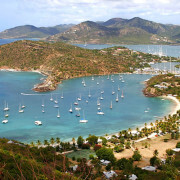 Others may owe much more to French tradition, with St. Lucia being a good example. Whatever their background culture, much of the area was once incorporated into the British Empire and, as such, the UK has left its mark. Of course, many colonial powers also brought African slaves into the region to work the plantations and other enterprises. Consequently, various African cultures have also merged into the regional cultures to create a unique hybrid. Yet as anyone who knows the region will tell you, each island – and sometimes parts of each island – has their own distinct culture. For example, Bermuda simply cannot be compared to St. Lucia – it’s not that one is better than the other, just that they’re very different. You should research the culture of an island and see whether or not it catches your attention, remembering that culture affects things such as cuisine, nightlife and so on. Another thing you might want to consider is the weather. True, almost everywhere will be able to rightly claim ‘great weather’, but in reality, if you check the statistics, you’ll see that the average weather can vary considerably from one island to another. In particular, look out for the wind and rain figures. Much of the area has a ‘rainy season’, though in many cases this is notional and represents the occasional 30-minute heavy shower with bags of glorious sunshine before and after. Even so, it’s worth looking into – particularly if you’re into beach life. Some islands have rather more protracted wet and windy seasons than others and that might be an important selection criterion when you’re booking Caribbean luxury hotels. Wherever your destination, you can be sure of plenty of Caribbean luxury hotels to choose from and that you’ll find this fabulous region every bit as wonderful as its reputation. New York, the city which never sleeps, has always been on my list of “Cities to Visit.” Before the last year ended, I planned to visit New York with my wife. Though I’m good at planning trips I’m really bad at making bookings for the hotel or the airlines so I asked her to get the ticket reservations done. To my surprise, she booked only one ticket which was for me and the other one she bought that through the miles program “earn united miles,” we travel mostly from united airlines so we had a huge stack of miles which she consumed to buy her own ticket. This way we saved money of one separate ticket which we planned to use for shopping and restaurant hunting in New York. Here I want to share with you how I planned our trip to New York as I mentioned above that I’m good at planning trips, I did the same for this trip as well. So here is how we did it and you can follow this for having a nice vacation. When To Visit New York City? Overall New York is the best city to visit all year round, but I think each season in New York have its own perks and disadvantages for visiting. I particularly like to travel in the winter season so winters are great for those who want to experience the holiday season in New York and are not much bothered with the cold. Spring on the other hand is also a good season to visit as you don’t have to face the summer heat but you might need to pack the umbrella. Summer is great for those who want to take the advantage of free events in this city, despite the fact that summers are hard to tolerate in New York. My Choice: So because I love the winter season I chose to travel in early December and spend my Christmas in New York with my wife and believe me it was an amazing experience of my life. How To Reach New York? If you live in US and you are in the neighboring cities of New York you can easily travel by car, train, bus or plane, if you are new in the city then I’ll suggest you travel by plane. Travelling by train, bus or car won’t cost you much, but if you are travelling through the air, then you may want to search for the best deals on airfares to reach New York. My Choice: I chose to visit New York via airplane; it’s easy and comfortable to travel through the airline. Where To Reside In New York? In New York you will find all kinds of accommodation from luxury hotels to cheap hotels, bed and breakfast inns to single tourist hostel, New York has accommodation for every kind of traveler. I wanted to lodge at a budget-friendly hotel so these were the options which I had in front of me. Stepping ashore from Lake Trasimeno onto the little Umbrian island of Isola Maggiore, it’s not hard to see why St Francis of Assisi once chose to live there as a hermit. A statue by the shaded lakeside commemorates his stay on the island throughout Lent in 1211, when he is said to have slept on a rock. Today, with no traffic at all and only one small village – where the buildings along its main Via Guglielmi date from the fourteenth century – Isola Maggiore is truly unspoiled. Only the presence of a small albergo, the occasional restaurant, a gelateria, and the tiny sprinkling of kiosks around the little jetty, show any real sign that the centuries have moved on. Paths criss-cross the island, leading up through ancient olive groves to the top of the hill, where the twelfth century Chiesa di San Michele Arcangelo sits overlooking the turquoise waters of the lake. Inside this church, the ancient frescoes – some of which are attributed to the school of Giotto – are still in wonderful condition and a guide is always on hand to explain about them. There are two further churches on the island (plus a couple more, which sadly only remain as ruins). The comparatively ornate Chiesa del Buon Gesu on Via Guglielmi can be found open most days, although the church of San Salvatore, reached via the earthen steps climbing up by the albergo Da Sauro, is generally closed. The fishing village, as it then was, enjoyed its peak during the fourteenth century, after a Franciscan monastery was built there in 1328. Centuries later, after its closure, the Guglielmi family acquired the monastery, building a castle in the grounds in the 1880s, where they lavishly entertained guests from the mainland. Over the centuries, Lake Trasimeno grew more and more shallow, making life for the island’s fishermen increasingly hard. As the fishing declined, so too did large numbers of the population, and with them went the Guglielmis. The family did, however, leave the strange legacy of Irish lace. The Marchesa Elena Guglielmi introduced the Irish lace technique in the early 1900s, setting up a Lace School on the island. Today, although fewer than 20 islanders now live on Isola Maggiore, you can still see one or two ladies making lace in front of their homes, and the Lace Museum displays many exquisite examples from the island’s past. As for the castle, in 1944 it was used for several months as an internment camp for political prisoners, then later fell into disrepair. Today, although inaccessible to the public, it is very slowly being restored. Across from the Lace Museum stands the Casa del Capitano del Popolo (‘The Captain’s House’), which tells the history of this enchanting island. The fishing may have declined, but it is still possible to enjoy carp, tench and pike fresh from the lake, served in any of the island’s little restaurants. Dine on a tranquil terrace as the sun sets and the water gently laps… what more could you ask? Rajasthan, the largest state in India, was historically a region fragmented into 18 princely states, 3 chieftainships and was united only by a term which was coined by the British, ‘Rajputana Agency/Province’, until 1949 AD. Even today a fleeting glance might fool you into thinking that this place is all about deserts and camels to the west, forests and wildlife to the east (and south) and a place where everyone’s mother tongue is Hindi (it is also the official language of the state); but one needs to take a closer look in order to understand that this land is just as geographically, culturally, linguistically and cuisine-wise diverse as any other part of India. Some of the major historical regions of Rajasthan are Dhundhar (includes Jaipur), Hadoti (includes Kota), Marwar (includes Jodhpur), Mewar (includes Udaipur, Chittorgarh), Shekhawati (includes Churu, Sikar, Jhunjhunu), Godwar (includes Falna, Abu), Mewat (includes part of Alwar, Bharatpur, Dholpur), Vagad (includes part of Banswara and Dungarpur) and Ajmer. While these regions are relatively smaller when compared to the huge size of India; they have their own dialects, their own style of cooking, their own deities, and last but not the least their way of living is in harmony with the geographical conditions (we need to remember that Rajasthan is all desert in the west, semi arid in the north and central, extremely hilly in the south and all green in the east) of their environs. Being such a fragmented region since time immemorial meant that there would be rivalries amongst kingdoms and when differences weren’t resolved through dialogue, war was inevitable. So, from a security point of view it was imperative for all the rulers of Rajasthan to defend their realms and that would mean constructing forts. The more the better, the bigger the better! It is a representation of this fact, that Rajasthan has numerous forts with each built differently as per the local landscape and environs, which prompted UNESCO to choose six of the most unique ones as World Heritage Sites. This article focusses on one such fort, of the Kingdom of Mewar, which is not only one of the oldest in Rajasthan but also one of the most massive ones to be constructed in the history of India, ever! Located in the wilderness, at a distance of 100 kms from the tourist’s paradise of Udaipur, a fort of gigantic proportion stands; a UNESCO World Heritage Site which a majority of tourists and people, generally, tend to ignore. They don’t ignore this fort because it is not worth looking at, they don’t ignore this fort because it does not have its own legendary stories to tell, they don’t visit this fort simply because they are not aware about this place. The sole aim of writing this article is to correct that anomaly so that whenever a tourist or traveler visits Udaipur or any destination in Rajasthan he/she does not miss out on a monument which has the second largest wall of Asia at 36kms, second only to the Great Wall of China, and some of the finest palaces and temples ever constructed in this region. Constructed on the orders of Rana Kumbha of Mewar (and hence named after him, Kumbhalgarh simply means the Fort of Kumbha) between 1444 – 1458 AD, this expansive fort was constructed on a series of hills at the border of the realms of Mewar and Marwar. 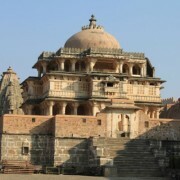 A fort built by a Jain ruler Samprati in the 2nd century BC and some temples located in the same area pre-dated the fort. As per legend when Rana Kumbha’s men could not erect a major bastion he was suggested by an ascetic to conduct a human sacrifice to appease the elements. It is believed that after some futile searching the ascetic offered himself for the sacrifice. The spot of his beheading has a temple there. After this, construction of the fort was undertaken successfully in full swing and as per folklore Rana Kumbha (who ironically was assassinated by his son in the same fort!) burned large lamps to facilitate the construction of fort even during night hours. Rana Kumbha had a prowess of architecture as well and he had designed (or co-designed) at least 32 of the 84 forts constructed during his lifetime. One of the salient features of this particular fort designed by him and his architect Mandan were the bottle-shaped bastions (bulbous at the base, narrow at the top) whose purpose was to desist escalade warfare (the opposing armies could not prop up their wooden ladders, to storm the fort walls, without the fear of breaking them as they would have been forced to be kept at an angle). These unique bastions were complemented with walls which were over 7 metres wide in some places (enough for 7 horses to run side by side). This gargantuan fort, replete with palaces (built in Rajput architectural style along with some influences Mughal architecture coming in at later stages), temples (constructed in the Nagara (North Indian) and Maru Gurjara (West Indian) styles of architecture), step wells, dams and multiple levels of defensive walls was a defender’s delight. Historical facts ascertain this fact, that while this fort faced numerous sieges the opposing armies, no matter how qualified and huge they were, could never break into Kumbhalgarh (the only time the Mewar army defending Kumbhalgarh surrendered, in 1578 AD, was when they ran out of ammunition!). It is no wonder that whenever rulers of Mewar felt threatened they would head here for safety. This fort’s importance can be judged from the fact that it was here that the toddler Rana Uday Singh was sneaked here (in 1538 AD) to prevent him from being assassinated following a palace coup, by Panna Dhai. The legendary Maharana Pratap, the eldest son of Rana Uday Singh, was born here (on May 9th 1540 AD), in the ‘Jhalia ki Malia’ (Palace of Queen Jhalia). Some decades hence when Maharana Pratap lost the, furiously fought, Battle of Haldighati (1538 AD) it was to Kumbhalgarh where he headed to and even though Mughal emperor Akbar laid an elaborate siege to capture him he managed to leave the fort successfully, after he ran out of ammunition. This fort was restored, at some places, and renovated by Maharana Uday Singh II in 1905 AD. He restored the battlements, the bastions and built the wonderful Badal Mahal after pulling down some old structures. Some of the major monuments which stand out from the rest in Kumbhalgarh are the Char Bhuja Temple (near Ram Pol), Baavan Deori Temple (a unique Jain Temple with 50 minor and 2 major sanctum sanctorums! ), Badal Mahal, Rana Kumbha’s Palace, Ganesh Temple, Neelkanth Mahadev Temple amongst others. Once the rulers of Mewar relinquished their claim over Kumbhalgarh, which happened the moment they signed the Instrument of Accession in 1949 AD, the royal sheen went away from this place. What’s left now is a couple of villages, inside the fort premises, whose inhabitants claim to be descendants of the royal servicemen appointed as caretakers of the fort. Even today, if one takes a walk over the impenetrable walls of this over 500 years old fort, the eerie silence present there would serve as a catalyst and enable one to feel the vibes of the bloody battles which were fought here by the defenders against a rampaging army to keep the fort and their sovereign safe, even at the cost of their lives. The Hill Fort of Kumbhalgarh might have been neglected by a majority of tourists and history enthusiasts of the world since quite some decades now, but it would take them only one visit to realise what Emperor Akbar’s great armies and other foes of the Mewar rulers felt when they gazed upon this fort, it’s ‘brute strength’. 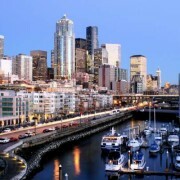 Once the land of the Native Americans, Seattle is rich in its natural beauty. Nonetheless, it is not far from civilization and sophistication. It gives you both the City and the Countryside under one roof. Here’s a list of the 10 premier locations in the “Emerald City.” These are the top choices with locals and tourists. Established in 1907, this public market is one of the iconic attractions in Seattle overlooking the Elliot Bay. It is spread over 9 acres of land and is home to more than 200 independent businesses. Started as a Farmer’s Market, you can treat yourself to fresh fruits, vegetables and sea food or take home floral bouquets, clothing, handicrafts and locally made jewelry. The Space Needle is a symbol for Seattle. Standing tall at 605ft, this observation tower was built during the 1962 World Fair. The Observation Deck at 520 ft offers breathtaking views of Seattle by day and night. It is open year round except on special holidays. If you get hungry, you can grab a meal at the SkyCity restaurant. A recent addition to Seattle, the Chihuly Garden and Glass Center is a phenomenal glass exhibit. It is divided into three sections namely the glass house, the garden and the interior exhibit. You can purchase a combined ticket for the Space Needle and the Chihuly Center to save a few dollars. If you do get a chance, watch it by night. Woodland Park Zoo is a real treat for nature lovers as it attempts to preserve local and exotic animal species by recreating natural habitats. There are over 1,000 species of animals and birds segmented into various exhibits. There is a nature-themed play space for children called the Zoomazium. You can bring a picnic or eat at the cafes and food kiosks. This is one of the premier tourist destinations in Seattle not only on account of the art it has on display but also for its stunning design and architecture. A walk here will give you a glimpse of the city, the harbor and the sparkling waterfront. The Seattle Aquarium near Pike Palace gives you a new way to explore the underwater. The aquarium is home to over 380 species of fish, marine animals and invertebrates. 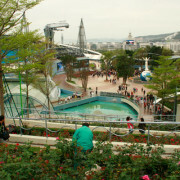 You can see the colorful fish through the underwater dome and pet creatures at the two large touch pool tanks. This is a government agency that organizes exciting boat rides to tour the Puget Sound area. On board you can grab a hot drink or simply stand on the deck and feel the light sprays of salt water on your skin. You can also take a ferry to Bainbridge Island. The Hiram H. Chittenden locks popularly called the Ballard locks connects Lake Union and Lake Washington to Puget Sound. The best time to visit is when the fish are going through the ladder. There is a specially designed 21 step structure that enables the fish to transfer from the saltwater to freshwater. You can see the fish swim through the ladder through the glass panels below. If you are an aerospace enthusiast, this place won’t disappoint. This museum takes you back into history with its 39 full-sized aircraft. There is Boeing, Air Force One, Concord and Connie to name a few. Many of the exhibits are from World War I and II. You will spend hours here without getting bored. When the climate does not quite favor an outdoor saunter, you can drop in at the Seattle Art Museum. It is quite big in size and showcases amazing highlights many of them belonging to Native American and Asian cultures. Comparatively, it has a smaller collection of European Art. 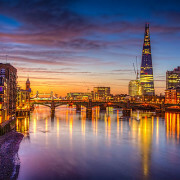 There is so much to see and do in London, especially if you’re based in one of the central hostels in London. Once you’ve seen the iconic attractions, why not explore the weirder, wackier side of this grand old city. 1. Ripley’s Believe it or Not – Head over to Piccadilly Circus and prepare to have your mind blown. From quirky exhibits to a breath-taking laser race, this is definitely one fun venue that shouldn’t be missed for the young, or the young at heart. 2. Sample the Beers of the Ages on a Pub Tour – If you’re a serious beer lover and have £20 to spare, you can book a pub tour of London’s East End, courtesy of Alternative London. This is a pretty good deal if you’re staying in one of the hostels in London and want to make the most of your limited time and have some fun to boot. 3. Chill Out in the Swimming Ponds of Hampstead Heath – There’s nothing like an ice-cold dip in the middle of winter to get your blood flowing again! Hampstead Heath’s swimming ponds are open all year round, ready to give you chills and thrills with a dip in the waters. 4. Gourmet Toast in Clapham – Feeling hungry? As in, really hungry? Breads Etcetera offers huge portions and you can eat as much as you can handle of their freshly baked bread. Pair it will one of their delicious omelettes and you’ll be good to go for the whole day. 5. Shop for Umbrellas at James Smith & Sons – London is renowned for its rain and you’ll inevitably need an umbrella if you don’t want to get sopping wet every time you step outside the hostels in London. You can always grab a cheap one, of course, but why not stay dry in style with a brolly from one of London’s most iconic stores, which has been around since 1830? 6. Dine Among the Dead – Always felt that your average restaurant is somewhat lacking in dead animals preserved in life-like postures? Then you may fancy visiting the Les Trois Garcon restaurant. Located in Shoreditch, you can enjoy a delicious feast under the watchful gaze of a host of stuffed (but very real) animals. It’s a taxidermist’s dream, but it’s not for everyone – although it’s certainly different! 7. Get Your Laugh On for Free – Monday nights in the Theatre Royal Stratford East are reserved for a bevy of stand-up comedy acts, and the best part is Comic Mondays are free! This is a great night out and very easily accessible from the central hostels in London. 8. Learn Some Fake History – Speaking of laughs, Bullsh*t London is a two-man comedian act-slash-walking tour of the South Bank. For £10, you can enjoy a two-hour long tour with a skewered, tongue-in-cheek version of London’s grand old history. Perfect for those who lean toward the irreverent. Salzburg is one of the most stunning cities in the world, and its historical legacy alone is enough for any tourist to fall in love with it. Whether it is the city’s ancient cathedrals and castles (which have endured for centuries), the scenic landscapes made iconic by the movie The Sound of Music, or simply the sheer beauty of the gardens and public parks of the city, there is something for every tourist in this lovely Austrian city. Fortunately, today’s travellers can now rely on a Salzburg shuttle service to get them to their accommodation quickly and easily, and once there, the following activities should be on any itinerary. Once the Salzburg shuttle service has transported you to your accommodation, it’s time to get out and explore. Although it’s the fourth largest city in Austria, it is very accessible and easy to get around – and there is so much to see! One of the highly recommended and most popular tours is a cycling tour around several locations used as sets in the 1965 musical film, The Sound of Music. Fans of the movie will be able to channel their inner Maria as they are guided around the iconic locations where the film was shot, including the beautiful Trapp Villa and Hellbrun’s gardens. It will take around 20 minutes from the Altstadt to the Trap Villa, but the pleasant cycling and the fantastic destination will not disappoint. Moreover, those who are self-confessed fanatics of the film could elevate the experience even more by booking a room at the Trap Villa and spending the night in one of the most important icons in 20th century cinema. Even without the Sound of Music tour, the city is an amazing destination that caters to many different types of tourists. For those who appreciate history, there are more than enough old cathedrals, museums, monasteries and castles in this UNESCO World Heritage Site. While many tourists prefer to explore the city on their own-arriving from the airport and getting to different destinations is easy enough with the Salzburg shuttle service -there are also guided tours that usually last for two hours and include numerous stops in the lovely Baroque city, including the famous Salzburg Dome Cathedral. Any trip to the city would not be complete without a visit to Mozart’s Geburtshaus, birthplace of the world-renowned classical music composer, Wolfgang Amadeus Mozart. 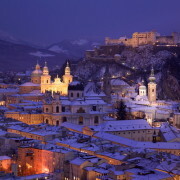 Your Salzburg shuttle service may even take you past Mozart’s Geburtshaus on the way from the airport. This incredible townhouse is filled with amazing collections that allow visitors an intimate glimpse into Mozart’s earlier life. The most notable items housed in the museum include the mini violin Mozart played when he was a toddler, a number of other instruments, and many portraits. While there are so many other attractions that are well worth visiting in this fabulous city, missing these three should not be an option.